“I always knew I would make harness racing my life,” she said. “It was never a question. I was hooked from the beginning. Not only were my mother and father involved, but I also had a strong influence from my grandfather and Uncles Scott and Dave Rankin. The Meadows is the home of the prestigious Adios for 3-year-old pacing colts. Adios, the son of Hal Dale, was originally trained by Frank Ervin and for awhile owned by Harry Warner of Warner Brothers. In 1948, Adios was bought by trainer/driver Delvin Miller to stand stud at his Meadowlands Farm. The son of Hal Dale/Adioo Volo emerged as the dominant pacing stallion of the ‘50s and ‘60s and is considered among the greatest sires of any breed. His male line is still prominent today through Artsplace, Art Major, Sportswriter and Sweet Lou. The Meadows Racetrack is also where some of harness racing’s top drivers launched their careers, such as Dave Palone and Brian Sears. 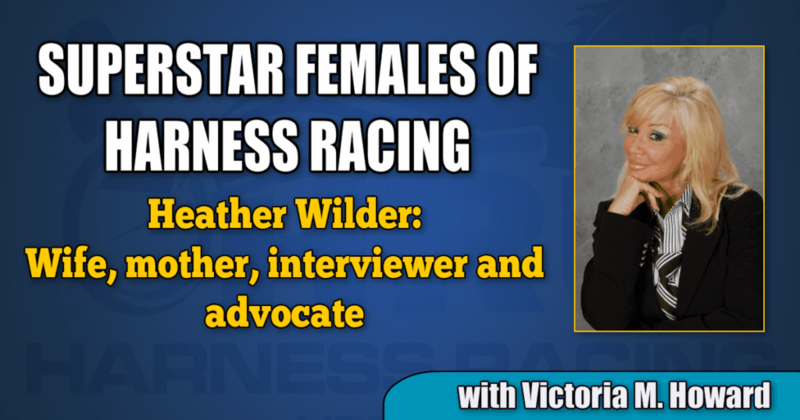 Little Heather Altmeyer grew up to be a beautiful (inside and out) young woman who is not only the wife to Mike Wilder and mother to daughters, Scarlett and Lauren, but a strong voice in harness racing. In 2013, Heather won The Lew Barasch Breakthrough Away Award, an award that honors a non-driver/trainer for early career accomplishments. “I love working with the horses and help my husband, Mike, in our stable as much as possible. I also try to be involved in different things in the industry such as helping Jenn Starr do race interviews at Mohegan Sun Pocono Downs and the simulcast at The Little Brown Jug,” Heather said. “I love every horse we own and treat them like one of the family. Of course, we can’t keep them all and I admit I cry when one leaves, but it is a business. It’s not easy raising a family in the business, for often it requires being on-hand 24/7, but for Mike and Heather Wilder, they found a way. Watching generations in harness racing succeed is encouraging and exciting and the Rankin/Altmeyer/Wilder clan is one of the best out there.